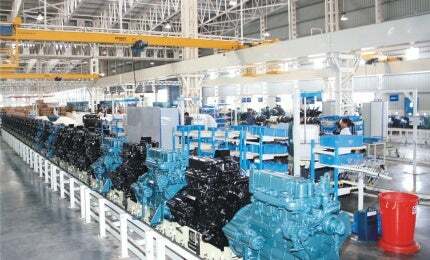 Kirloskar Oil Engines is India’s leading diesel engine, agri pump set and generator manufacturing company. Kirloskar engines cover a power envelope ranging from 4hp to 800hp and from 2,400hp to 11,000hp, in both air-cooled and water-cooled versions. Kirloskar manufactures more than 225,000 diesel engines annually that are used for over 100 applications in segments such as mining, offshore, construction, material handling, earth moving, fluid handling power generation, agriculture and agro-industrial, in addition to defence and marine applications. Kirloskar Green is one of the leading brands in Gensets with more than 50,000 generators manufactured each year. The Kirloskar Green brand is currently available in power ranges from 10kVA to 625kVA in both 50Hz and 60Hz, with future plans to extend this to 1,000kVA. Kirloskar Green generating sets are designed to provide a reliable source of power even in tough, intensive conditions. The generators are available as open sets or silent sets with weather and sound-proof enclosures, with options for manual or automatic mains failure functions. Kirloskar’s range of emission compliant air-cooled diesel engines that meet high-precision, quality standards and reliability while remaining economical. The air-cooled engines are offered in a power band of 14kW to 81kW, and are used in various mining applications including underground mining loaders, load haul dumpers (LHD), dump trucks, mining drill rigs / bolters, utility vehicles and personnel carriers. These engines are popular in South Africa’s mining industry with engines being supplied to major mining companies including Anglo Platinum, Aquarius Platinum, Glencore Xstrata group and Impala Platinum. Kirloskar’s distributor in South Africa offers extensive spare parts back-up, specialised service staff and a workshop facility that supports the products in-field. Kirloskar ensures that customers receive quality products at competitive prices, backed-up by an immaculate after-sales service to suit the demands of the mining industry. This full service package enables lower investment costs, lower running costs and greater reliability, leading to a reduced total cost of ownership. In addition to mining machines, HA series engines are also used in applications such as dewatering pump sets, irrigation pump sets, hydraulic power packs, off-highway mobile machinery, vacuum pumps, high-pressure cleaning pumps, construction machinery, crushers, screening plants, compressors, and more. The water-cooled engines are used in wide range of applications including generators, construction and earth moving equipment, material handling equipment, water pumps, fire pump packages and agricultural equipment. The R series water-cooled engines are supporting mining equipment in South Africa, where Kirloskar’s engines are installed in heavy equipment such as underground LHDs and dump trucks. Kirloskar offers an extensive selection of agri pumpsets and agro-industrial engines in power ranges of 3kW to 20kW. These engines are designed for rugged conditions and serve as reliable prime movers for mining and industrial applications. Kirloskar Oil Engines supplies Asia’s only factory Mutual (FM)-approved and Underwriters Laboratories (UL)-listed diesel engines that meet NFPA20 standards. The engines are used for fire suppression system installations as they are cost-effective, robust and reliable. Kirloskar’s FM-approved and UL-listed engines are available in 19 different power ratings ranging from 45kW to 245kW and speeds from 1,760rpm to 2,600rpm. Incorporated in 1946, Kirloskar Oil Engines Ltd is the flagship company of the Kirloskar group from India. Kirloskar has four state-of-the-art manufacturing units of diesel engines in India offering world-class products that are exported to more than 35 countries worldwide. Kirloskar Oil Engines is an independent public listed company that has a turnover of $500m, while the Kirloskar Group has a turnover of $1.6bn. Kirloskar Oil Engines has many accreditations including ISO: 9001, TS16949, ISO: 14001, QS 9000 and OHSAS 18001. Kirloskar Oil Engines’s mission is to become a truly multinational business by powering vital industries with reliable engines and a first-class after-sales service.